There are contrasting theories on the relationship between income inequality and growth, and the empirical evidence is similarly mixed. This column highlights the neglected role of equality of opportunity in mediating this relationship. 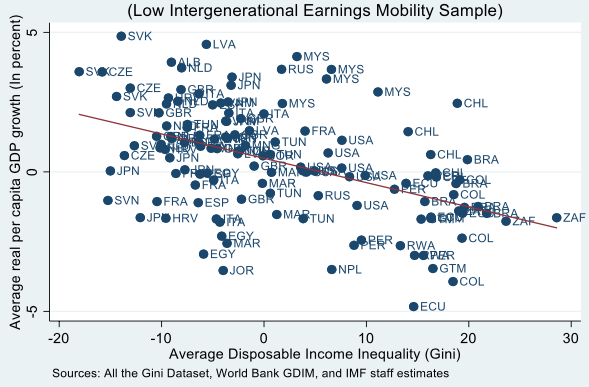 Using the World Bank’s new Global Database on Intergenerational Mobility, it shows that in societies where opportunities are unequally distributed, income inequality exerts a greater drag on growth. Despite the firm consensus that income inequality is intrinsically undesirable, its impact on economic growth is much disputed. Simon Kuznets famously argued that inequality is beneficial for economic growth at an early stage of development, since a moneyed capitalist class can undertake more investment, but is harmful at a later stage. Others have pointed to inequality as a necessary, even desirable outcome of rewards to innovation and risk-taking. But there are also numerous theories about how income inequality can reduce investment and hinder the full realisation of human potential. As a canonical example, Galor and Zeira (1993) show that if poor families are constrained to under-invest in education, aggregate growth falls. The empirical evidence is similarly mixed. Barro (2000) finds that for developed economies income inequality raises growth. On the other hand, Berg et al. (2012, 2018) find that income inequality tends to reduce the duration of growth spells. Forbes (2000) and Panizza (2002) find no systematic effect. In recent work (Aiyar and Ebeke 2018), we point to the neglected role of equality of opportunity in mediating this relationship. Our hypothesis is simple. In societies where opportunities are unequally distributed – where the material circumstances of parents act as binding constraints on the opportunities available to their children – income inequality exerts a greater drag on growth. Any increase in income inequality tends to become entrenched, limiting the investment opportunities – broadly defined to include investment in children – available to low-income earners, thereby retarding long-term aggregate growth. On the other hand, in societies with a more equal distribution of opportunities, an increase in income inequality can be more easily reversed and need not constrain investment opportunities and growth. To the extent that inequality of opportunity matters in this way, its omission from standard regressions of growth on income inequality leads to misspecification, which can help explain the inconclusive nature of the empirical literature to date. We measure a society’s distribution of opportunity by the economic mobility of its people across generations. 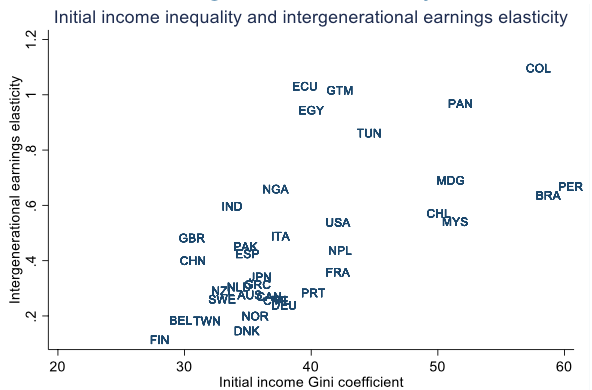 The World Bank’s new Global Database on Intergenerational Mobility (GDIM) compiles cross-country estimates of the elasticity of a son’s income (or education level) with respect to the income (or education level) of their father (Narayan et al. 2018). The higher this elasticity, the lower the degree of intergenerational mobility, which we take to signal a less equal distribution of opportunity. Because each observation requires a comparison of life-cycle income over two generations, this is a slow-moving variable whose latest value says something about societal conditions over a period of several decades. For the purpose of our study and due to data availability constraints, we take this variable to be time-invariant. Our empirical specification comprises a dynamic panel regression of economic growth on income inequality, measured by the Gini coefficient. The specification includes several control variables, corrects for endogeneity concerns using the system-GMM estimator, and covers more than 100 countries. So far this is quite standard. But we introduce a crucial innovation: the right-hand side of our regression includes an interaction term between the (time-varying) Gini coefficient and our measure of inequality of opportunity, the (time-invariant) intergenerational elasticity of income. We find that the interaction term between the Gini coefficient and either measure of intergenerational immobility (income or education) is negative and strongly significant, confirming our central hypothesis: the higher the degree of inequality of opportunity, the more detrimental the impact of an increase in income inequality on growth. This result is robust to multiple specifications and robustness tests. 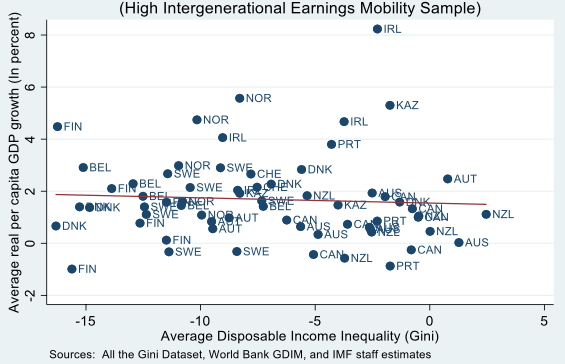 A graphical representation of the result is provided in Figure 1, where we split the sample into countries with low intergenerational mobility and high intergenerational mobility, using an endogenous threshold determined from the nonlinear regressions. There is little discernible relationship between growth and income inequality for the first group, while the slope of the ‘regression line’ is clearly negative for the second group. Note: The scatter plots show the residuals of both real per capita growth and the income Gini derived from fixed effects regressions using five-year average data for a large set of countries over 1970–2015. The controls include the lagged levels of real GDP per capita, the domestic investment rate, level of education, and trade openness. The regressions also control for period fixed effects. The cut-off for intergenerational mobility into high and low bins is set at the value 0.3, which is the endogenously-determined threshold from the full-fledged non-linear estimations in Aiyar and Ebeke (2018). One concern with our empirical strategy is that our interaction term is simply picking up initial conditions, that is, the degree of income inequality that prevailed across countries at the beginning of our time series (i.e. in the 1960s or 1970s). This is a real concern. Figure 2 shows the positive association between initial income inequality and the intergenerational elasticity of income, sometimes called the ‘Great Gatsby curve’. To address this concern, we run a version of our regression in which we include two separate interaction terms: one between income inequality and the intergenerational elasticity of income, as before, and another between income inequality and the (time-invariant) level of income inequality in the first period. The introduction of the second interaction term does not significantly alter the baseline results, implying that there is something very specific about inequality of opportunity that cannot be reduced a country’s initial level of income inequality. Intuitively, even a high initial level of income inequality need not completely stifle growth provided that there are economic institutions to prevent these inequities from being transmitted across generations, that is, if the opportunity exists for the next generation to compete on a somewhat equal footing despite the income disparities of the parent’s generation. In our study we are agnostic about the precise nature of the transmission channels from inequality of opportunity to the growth–income inequality relationship. But we can think of at least three lines of enquiry for future research, which our results suggest might be of first order importance. First, unequal access to education can limit low-income children from realising their full capabilities. This is clearly a tragedy for reasons that extend far beyond mere economics, but by permanently reducing the productivity of a segment of society it can also retard economic growth. Second, unequal access to labour markets is often seen between amply protected ‘insiders’ and unemployed or precariously employed ‘outsiders’. An increase in income inequality will tend to most strongly affect those on the wrong side of this barrier, with hysteresis effects translating this into a permanent output loss. Third, unequal access to finance can prevent low-income people from entrepreneurship opportunities and human capital investment, with an obvious retarding impact on growth. Each of these proposed channels lends itself to specific remedial policies. Unequal access to education can be tackled by public subsidies for schooling, especially at an early age. Unequal access to labour markets calls for policies to reduce labour market duality and to lower structural unemployment. Unequal access to finance requires reforms to ensure that the supply of funds is directed to those with the best ideas rather than those with the best pedigree. Our results suggest that it is of first order importance to conduct careful empirical research into the relative importance of these – and possibly other¬ – transmission channels. This would help prioritise policy actions to improve equality of opportunity, thereby serving the twin goals of justice and growth. Aiyar, S and C Ebeke (2018), “Inequality of opportunity, inequality of income and economic growth”, IMF Working Paper WP/19/34. Barro, R (2000), “Inequality and Growth in a Panel of Countries”, Journal of Economic Growth 5(1): 5-32. Berg, A, J Ostry and J Zettlemeyer (2012), “What makes growth sustained?”, Journal of Development Economics 98(2): 149-166. Berg, A, J Ostry, C Tsangarides and Y Yakhshilikov (2018), “Redistribution, Inequality, and Growth: New Evidence”, Journal of Economic Growth 23(3): 259-305. Forbes, K (2000), “A Reassessment of the Relationship between Inequality and Growth”, American Economic Review 90(4): 869–887. Galor, O and J Zeira (1993), “Income Distribution and Macroeconomics”, The Review of Economic Studies 60(1): 35–52. Narayan, A, R Van der Weide, A Cojocaru, C Lakner, S Redaelli, D Mahler, R Ramasubbaiah, and S Thewissen (2018), Fair Progress? Economic Mobility Across Generations Around the World. Equity and Development, World Bank. Panizza, U (2002), “Income inequality and economic growth: Evidence from American data”, Journal of Economic Growth 7(1): 25–41.